When we went to visit my in-laws, my brother-in-law offered us some of his coffee. It wasn’t ordinary coffee, it was Instant Weasel Coffee. 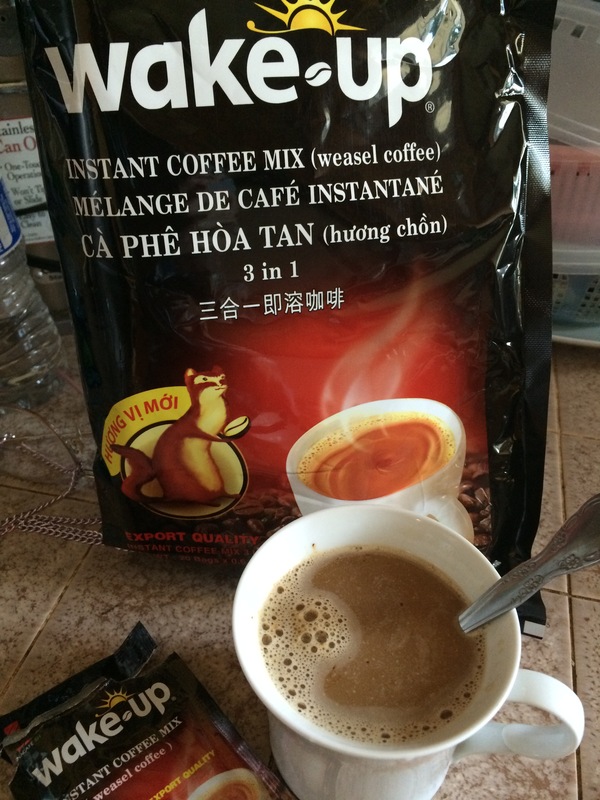 Instant Weasel Coffee seems like an oxymoron since weasel coffee (or civet coffee) is made from coffee beans that have gone through the digestive track of a small cat-like animal called the civet. The story goes that civet coffee was discovered in Indonesia where palm civets would come at night to the Dutch coffee plantations and eat the ripest coffee berries. The plantation workers cleaned the excreted beans and roasted them. The digestive process of the civet breaks down the proteins in the coffee, giving it a smooth flavor without any bitterness or after taste. A wild civet is solitary and nocturnal with a range of 2 to 17 square kilometers, making civet coffee hard to obtain. 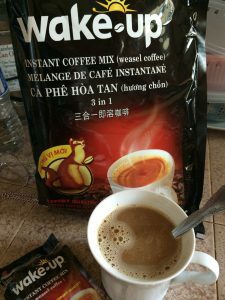 After connoisseurs discovered this drink (known as cà phê chồn in Vietnam and kopi luwak in Indonesia), industrial production began. The central highlands coffee producing region of Vietnam has several farms each with hundreds of civets on a few hectares. The demand has also resulted in caged civets force-fed coffee beans. Authentic weasel coffee is one of the most expensive coffee beans in the world, costing hundreds to thousands of dollars per kilogram depending on if it is from caged or wild civets. It’s second only in price to Black Ivory coffee which is produced from coffee beans excreted by elephants in Thailand. Food scientists have found they can imitate the taste of weasel coffee by treating the beans with enzymes. This instant version is a form of imitation weasel coffee. I thought it was pretty good. Lượng liked it so much that he bought three bags!